<br /><br />Pickysaurus: Thanks for taking the time to speak to us. Firstly, why don’t you tell us a little bit about yourself? <br />Pathoschild: I'm a web developer by day, so modding is a nice change from my usual work. I actually became a modder accidentally. There were some issues with a mod I wanted to use, but the author had lost the code and was too busy to work on it. I decompiled the mod with their permission, added some fixes and improvements, and offered a pull request so they could release the changes. They preferred working alone though, so they suggested forking it instead. That became my first mod, Chests Anywhere, and I figured I might as well keep working on it. <br /><br />Things just snowballed from there. Now I develop SMAPI (the modding API), the mod build package (used to create mods), my own mods, the upcoming web API and toolkit, and internal tools for modders; maintain mods for some inactive authors; write documentation on the wiki; moderate /r/StardewValley and the Stardew Valley Discord; provide support on Discord/Nexus/Reddit/forums; submit pull requests to other modders and prepare unofficial updates; etc. It's pretty much a full-time hobby at this point, so it's weird that it all started with a bug fix. <br /><br />The*Stardew Modding API (SMAPI) for Stardew Valley which is a cornerstone of the modding community in that game, but for the uninitiated,*what is SMAPI and how did you end up maintaining it? <br />SMAPI loads mods into Stardew Valley, and hooks into the game to provide events and APIs for mods. Most types of mods aren't possible without SMAPI. It also rewrites mods for compatibility (e.g. so nearly all mods work on Linux/Mac/Windows despite the game differences), intercepts errors and usually auto-recovers the game, provides mod update alerts and compatibility checks, and creates daily save backups. Mainly it's a framework for modders though, so most of its features aren't directly visible to players. <br /><br />When I got into modding, SMAPI was a fairly small Windows-only project and was no longer in development. After I contributed some improvements, the maintainer transferred the project to me since they'd moved on to other things. SMAPI 1.0 was my first release, and I just kept going after that. <br /><br /><br />What is it that draws you to Stardew Valley and what is it about modding that you enjoy most? <br />Stardew Valley has the most friendly and welcoming community I've seen. It's a community where someone can ask newbie questions, and they'll get lots of friendly explanation, guidance, and positive feedback. The elitism I've seen elsewhere isn't really present. There's a lot of really cool stuff that happens when players, new modders, and veteran modders can all chat and work together. I enjoy working with that community and it's great to see my work put to good use. <br /><br />Thanks to the extension you created, Vortex*now supports direct downloads and management of Stardew Valley mods. What do you think of Vortex as a mod manager for players of Stardew Valley? <br />SMAPI mods are easy to install, but players often want a mod manager to organise their mods, keep track of updates, and switch between profiles. There aren't many options for Stardew Valley though. Vortex's extensions system is great for letting smaller communities add support for their games. It's still in alpha, but I think it'll be a solid option when it's released. <br /><br /><br />You also have a selection of useful mods for Stardew Valley, including Lookup Anything, Automate and Chests Anywhere. What inspires you to work on these varied projects? <br />A few of my mods aren't original: Chests Anywhere and Tractor Mod continued from earlier abandoned mods (with permission and credit), Automate was created from scratch based on a different vision for CJB Automation (which I was maintaining), and Debug Mode was a better alternative for a SMAPI feature removed in 1.0. <br /><br />Most of my other mods are meant to peek under the game's hood and make things easier. Data Layers shows various data layers like hidden paths and sprinkler range; Skip Intro gets you into the game much faster (especially useful when testing mods); Fast Animations speeds up repetitive animations; and Lookup Anything demystifies in-game mechanics and shows useful info (with a data mining option to show the internal game data). <br /><br />Content Patcher is a bit different. It aims to replace*an entire category of mod which has many limitations, while providing a framework for non-programmers to create complex mods without writing any code. I'm really happy with how well it's worked out so far, and I have a lot more planned for it. <br />When you are not busy modding, what other things do you like to do for fun? <br />I also like reading and games, exploring the festivals and events in the city (Montreal has lots of those), mountain hiking, kayaking, and being out in nature. My perfect vacation would be a mountain or beach cabin in a thunderstorm with a good book. <br /><br /><br />In regards to gaming: Which game do you have the fondest memories of? *What games are you currently playing, if any? <br />The Witcher 3 was probably my favourite game. I loved its open world full of interesting content (without the busywork like "find every rock" that other games often have), its more nuanced decisions and morality, and its storytelling quality. I don't actually play Stardew Valley anymore. After spending so much time modding it, I'd rather take a break by playing other games. I've been playing through Dark Souls recently. <br /><br />Back on the topic of modding - have you ever created mods for games other than Stardew Valley, or are there any you’d like to try? <br />Nope. I've used mods for other games, but I never got into their modding scenes. I'm not sure I'd have time to mod anything else at this point, with all the projects I have for Stardew Valley. <br /><br />How does it make you feel that hundreds of thousands of people out there are using a tool that you developed? <br />It's pretty awesome. Coming from an industry that's often about monetising users, creating something just for their enjoyment is a great feeling. <br /><br /><br />Are there any authors in the Nexus Mods community whose mods you particularly enjoy playing? <br /><br />Some mods are impressive technical achievements (one mod added multiplayer before the game supported it), but I've always been fond of the simpler quality of life mods. I have a list of my favourites*for players looking for their first mods. <br />We have recently rolled out our Donation Points system as well as our Patreon to help the community supplement our donation fund that we pay into ourselves. Being a mod authors yourself, what are your thoughts on this new system? <br />I love the concept — most modders get pennies per hour at best otherwise, so getting a bit of money back is great! I really appreciate Nexus doing it. I feel like the current implementation is heavily tilted towards bigger communities like Bethesda games though, and linking donation points to unique downloads incites modders to create lots of small mods/clones instead of continuing to improve their existing mods. That said, I think it's a good idea overall and I'm interested to see how Nexus improves it over time. <br />Is there anything else you would like the community to know about you, your plans, or future projects? <br />Chucklefish added a lot of my suggested changes to help modders in Stardew Valley 1.3. 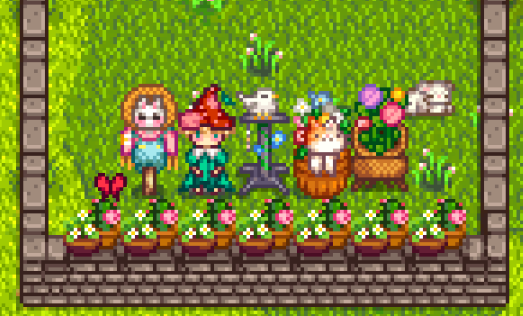 If you use Stardew Valley mods, keep an eye out for mods doing lots of new things in the future! <br />If you're interested in giving Stardew Valley a try, check out the GOG.com page for it here.